Shiiine On launch a new one day festival at Birmingham Genting Arena on Saturday 8th September 2018. The incredible line-up includes more than 20 Iconic bands and a Hacienda afterparty. Orbital, Shed Seven, Happy Mondays & Julian Cope headline, joined by a stellar supporting cast. The all-day event will be headlined by dance pioneers Orbital who are set to mark their 30th year in music in style. Renowned for their headline slots at Glastonbury amongst others, they will perform their full festival show in Birmingham. Resurrected indie heroes Shed Seven who are riding high on the success of their recent top ten album ‘Instant Pleasures’, and Happy Mondays who after 30 years in the business remain one of the most important bands around also play the main stage. A worldwide exclusive, Shaun Ryder supports himself with a Black Grape set earlier in the day. This is the first time both Shaun’s legendary bands have shared a bill anywhere in the world. Main Stage also features performances by two previous headliners of the Shiiine On Weekender – Embrace who are celebrating a top 5 album with ‘Love Is A Basic Need’ and Liverpool legends Cast. The Forum Live is headlined by Julian Cope with an epic supporting cast comes from The Wedding Present, Gang Of Four, A Certain Ratio, The Stairs,The Membranes, Psyence and Deja Vega. The outdoor stage, sponsored by Europes leading ticket company Eventim, features headliners Reverend and The Makers. They will be joined by Dreadzone and Bentley Rhythm Ace. Jim Bob performs a solo set and his Carter USM bandmate Fruitbat’s band Abdoujaparov and Smoove & Turrell complete the line-up. Ticket prices include entry to two special after-show parties. In the Main Arena the Hacienda will descend on Birmingham with Todd Terry headlining a superb line up alongside Marshall Jefferson and Jon Dasilva. In the Forum Live, Star Shaped bring us their Britpop disco featuring Ocean Colour Scene’s Steve Cradock. Steve will be playing the best of his vast Northern Soul and Motown collection. The “In conversation” stage hosts Steve Lamacq who will be performing his “Going Deaf for a Living” show and Steve “Adj” Atherton relaying hilarious tales of his time with the Stone Roses. Exclusive 48 hr Pre-sales access for members of the Shiiine On Mailing list from Wednesday 2nd May 2018. General sale tickets for the event go on sale on Friday 4th May at 10am from www.shiiineon.com, Eventim and all leading ticket outlets. An exclusive presale takes place on Wednesday 2nd May at 10am, for subscribers to the Shiiine On mailing list. 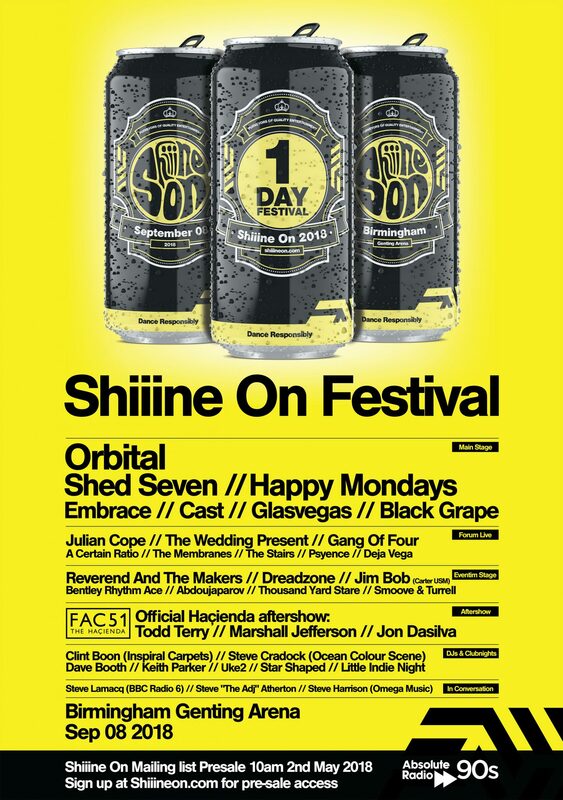 Sign up at shiiineon.com to ensure priority access. – Shiiine On Festival takes place at Birmingham Genting Arena, Perimeter Rd, Marston Green, Birmingham B40 1NT. – Saturday 8th September 2018. – Doors open at 12.30. Curfew 3am.